Liberally salt and pepper the inside of the turkey cavity. Stuff the cavity with two halves of an orange, ½ lemon, 3 cloves garlic, bunches of parsley, thyme, rosemary, and sage, and 2 slices of onion. Drizzle cavity with coconut oil. Stuff the neck cavity with 2 cloves garlic and 1/2 lemon. Stuff sage leaves and 2 cloves garlic underneath skin of breast. Brush the outside of the turkey with liberal amounts of coconut oil and sprinkle with salt, pepper, garlic powder, and thyme leaves. 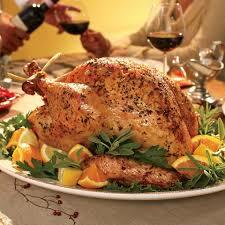 Tie the legs together with cooking twine and tuck the wing tips under the body of the turkey. Place cut carrots, rest of onion, 4 cloves of garlic, and remaining herbs and orange in the bottom of a large roasting dish. Toss with coconut oil and salt. Set turkey on top. Place turkey in oven for 10 minutes, then without opening the door, turn down the temperature to 325 minutes and roast for 30 minutes more. Baste with juices every 15 minutes, roasting for a total of nearly 3 hours, or until the juices run clear when turkey is cut between the leg and the thigh. If juices run low, baste with turkey bone broth. Remove from oven and cover with aluminum foil to rest for 15 minutes before carving. Reserve drippings and onions for cashew cream gravy, if desired. Combine pan drippings from cooked turkey with 1 cup bone broth, shallots, sage, garlic, and bay leaves in a saucepan. Bring to a boil over medium heat. Cover and turn off heat. Let stand 10 minutes. Remove bay leaves and place mixture in blender with soaked cashews and caramelized onions. Blend until smooth. Season with salt and liberal amounts of freshly ground pepper. Dilute with more bone broth to thin, if necessary. Get this recipe and more in our new holiday magazine, free with every order.